At DMAC, we prevent our clients’ concerts going awry by providing them with pre-concert planning and security arrangements. We also provide state-of-the-art monitoring and GPS technology to handle emergencies. A concert venue is essentially a large space built to house a large number of people and has limited exit points; a factor that may prove to be a problem if the concert goes haywire. In the light of a recent rise in concert venues being targeted by terrorists and other anti-social elements seeking to disrupt societal harmony, it has become increasingly important to terror-proof venues and the establishment of a fearless environment for concert-goers. Employing adequate security has become the norm. 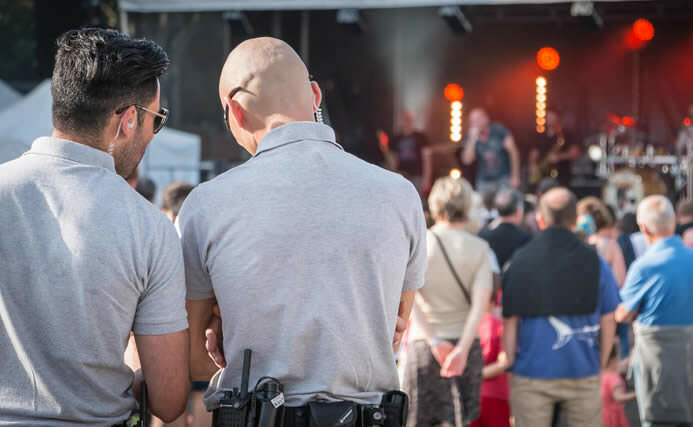 Security guards can help secure the concert perimeter, manage the crowd, direct traffic and make sure that every attendee is safe and has a good time at the concert. A large crowd tends to become unruly pretty quickly. In order to prevent problems like stampedes and violent behavior from people, it becomes imperative to take charge of the situation before things get out of hand. Our security staff is prepared to prevent the occurrence of such unpleasant events by maintaining a strict vigil and tackling them if the need arises. Fans tend to linger near the backstage and VIP areas in order to get a glimpse of their favorite stars. There have been instances of celebrity manhandling by fans in the past, which is why our security staff maintains a strict vigil over such restricted areas. Entry and exit points are monitored according to the protocol set by the event planner. Our well-trained security is empowered to take care of unpleasant situations arising during concerts. This may refer to unruly fans or possibilities of protest from unwanted groups. In such cases, our security is perfectly capable of escorting the trouble-makers out of the venue.